While using our computer monitors or LED screens, we use resolution terms like 480p, 720p, 1080p, 4K etc. Let’s see what this means and which resolution is best suitable for what type of work. Before starting with the numbers, we must be aware of the meaning of resolution. In this article we cover everything related to resolutions, pixels and why does it matter? 7 What is p and i in resolution numbers? Pixel is the smallest square dot on the monitor screen which emits a specific color. Resolution is the total number of pixels that can be displayed on a monitor. Number of pixels matter a lot when we are talking about image or video clarity. More pixels in an image forms a much sharper image. If your image has more pixels it would be easy for you to see the details of an image even if you zoom in a lot. Normally we represent resolution in two numbers. Number of pixels displayed horizontally x number of pixels displayed vertically. For example, right now my screen resolution is 1920 x 1080. 480p has a resolution of 720×480. This means that it has 720 pixels horizontally and 480 pixels vertically. The standard channels that we see on TV support this type of resolution. So if you want to buy a TV only for watching news channels etc. you can for a 480p resolution TV. Make sure that your screen size 32″ and you are viewing the screen from a distance of at least 5 meters. Otherwise, your screen will seem like distorted. 720p has a resolution of 1280×720. This means that it has 1280 pixels in the rows and 720 pixels in the column. Channels that stream movies or TV shows usually support this resolution. So if you are fan of that you should go for a resolution of 720p resolution. Many movie and TV show channels now have special subscription to view channels in 720p. Most budget phones now have 720p displays. 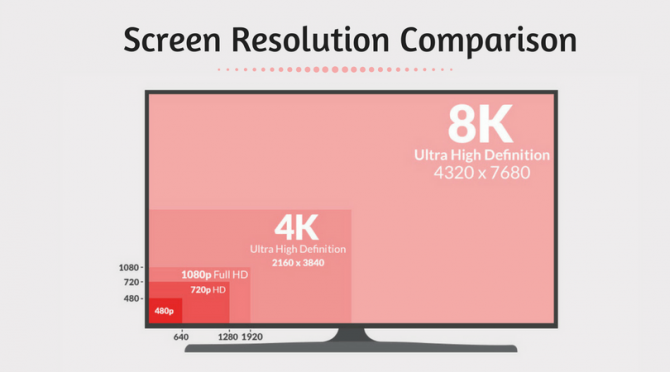 With this resolution, you can go with larger screens as high as 60″. The optimal viewing distance depends upon the screen size, the larger the screen size, the farther you should site to have a clearer view. 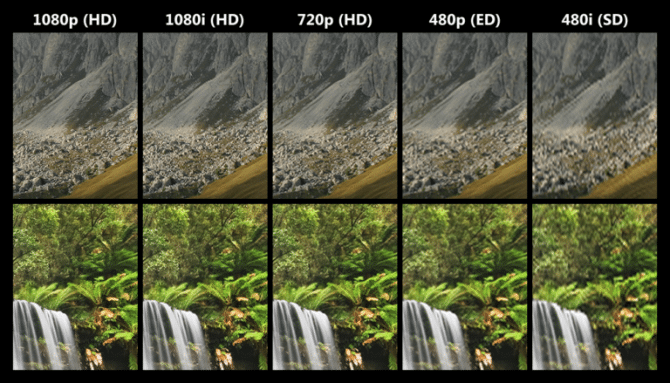 1080p has a resolution of 1920×1080 pixels. LCD’s and LED’s have 1080p displays. It is double the size of 720p displays. It does not make much difference if you view it for TV shows or movies unless you sit very close to the screen. It is usually useful for gamers who are into graphics and a slight action can make a lot viewing difference. The blue ray movies we see are actually in 1080p resolution. 4k is actually a 2160p. It has a resolution of 3840×2160 which is insanely high. Now these are very advance and cost a lot of money as compared to those given above. So if you want to watch regular TV you don’t have to go for a 4K resolution TV, it’s just waste of money unless you sit so close to the TV that you can distinguish the number of pixels. It is usually good for gamers who lay high end graphic games. Now many movies are coming out at ultra-blue ray that are 4k resolutions. YouTube now supports 4k videos. Some devices can record in 4k resolutions but it gets expensive when you buy a 4k resolution TV for daily use. While there are other resolutions but we have only discussed the most common ones. The rule of thumb is that the larger the resolution, the clearer the picture quality. But higher resolutions will be more expensive too. It is best to select the optimal resolution according to your needs. What is p and i in resolution numbers? p in the 480p, 720p and 1080p stands for “progressive” which means that the pixels in the display are aligned in a vertical and horizontal format. they are not interlaced or entangled which is used for some displays represented with an”i” at the end of pixel numbers. Please note that while resolution is not the only factor for clearer and sharper images, it is definitely an important factor. When you are selecting a resolution, you should take other factors in consideration like the quality of content you are watching, the position at which you are watching and the distance between you and the screen. If we have missed anything, please let us know in the comments below.